We Turn Your Designs into Code. 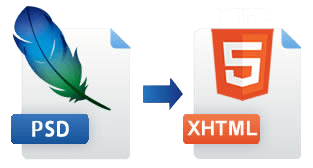 If you want audio as well as video support without usage of additional components like Flash, you can opt for our HTML5 Development services. We ensure that you get a neat and tidy structure along with the desired audio and video support. This is done by using various advanced tags which gives the best output. Precision of Pixel : We ensure our conversions look exactly like the provided PSD file by using our own tools. Compatible with all Browsers : Our Quality Assurance team double checks that your website is displayed in all supported browsers and whether it functions properly. Compliance with Web Standards & Accessibility : Our markup and CSS are W3C Valid and we adhere to the basic accessibility principles for all our projects. Semantic Markup : We use proper HTML5 elements for markup. We also use Micro formats wherever applicable. Fast Loading : We optimize images for loading and reduce the number of HTTP requests by using CSS sprites. Nicely Formatted & Commented Code : By formatting our code properly and using comments when needed, we make it easy to read and understand.